1849 - to help create Yardley Wood Ecclesiastical Parish. 1911 - Springfield Ecclesiastical Parish created from Sparkhill. 1907 - Hall Green [Marston Chapel], formerly a chapel of Yardley Ecclesiastical Parish , was created an Ecclesiastical Parish from Yardley Ancient Parish. By 1950s, called 'Marston Green'. 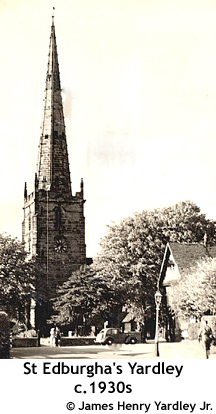 Later it was Hall Green Parish Church. 1968 - to help, together with Tile Cross Ecclesiastical Parish (Warwickshire), create Lea Hall Ecclesiastical Parish. Yardley was abolished civilly in 1912 entirely to Birmingham Ancient Parish. No Parish Registers held at Worcestershire Archives. Original registers at Library of Birmingham. YARDLEY (Job Marston Chapel, Hall Green) : Christenings 1704-50, 1761-1840, Marriages 1704-14, 1728-46, 1862, Burials 1705-18, 1725-49, 1761-1840 [Microfiche.] Published Birmingham & Midland Society for Genealogy & Heraldry 2002 Author Harrison, Yvonne (transcription.) Source D: Birmingham & Midland Society for Genealogy & Heraldry. YARDLEY (Job Marston Chapel, Hall Green) : Christenings 1704-50, 1764-69, 1780-1840, Marriages 1704-14, 1728-46, Burials 1705-49, 1780-1840 [Typescript.] Published , 1966 Author Phelps, S D (transcription). 1871 census Greater Birmingham (part) plus Budbrooke, Dunchurch & Leamington surname & folio index plus images of the folios for pieces RG 10/2968-2974, 3076-3086, 3088-3089, 3119, 3134-3160 & 3187-3193 [CD-ROM] - Published Birmingham & Midland Society for Genealogy & Heraldry 2004 - Author Birmingham & Midland Society for Genealogy & Heraldry. Warwickshire 1891 census returns: Solihull registration district RG 12/2461-2466 [Microfilm.] - Published London Public Record Office 2003. Yardley Workhouse register of inmates 1812-37 [Microfiche.] Published : Birmingham & Midland Society for Genealogy & Heraldry, 1995 Author Harrison, Yvonne (transcription.) Source D: BMSGH. YARDLEY, a parish in the upper division of the hundred of HALFSHIRE, county of WORCESTER, 4½ miles (E.) from Birmingham, containing 2313 inhabitants. The living is a discharged vicarage, in the archdeaconry and diocese of Worcester, rated in the king's books at £9. 19. 4½ and in the patronage of Edmund Wigley, Esq. The church, dedicated to St. Edburgh, exhibits various specimens of the English style of architecture, with a fine tower and spire of the later date; it has lately received an addition of one hundred and twenty sittings, of which one hundred are free, the Incorporated Society for the enlargement of churches and chapels having granted £100 towards defraying the expense. Here are various bequests, producing a considerable income, for the education and relief of the poor. Great quantities of tiles are made in the neighbourhood, and conveyed to Birmingham, whence they are sent by the canals to various parts of the kingdom. MARSTON, a chapelry in the parish of YARDLEY, lower division of the hundred of PERSHORE, though locally in the upper division of the hundred of Halfshire, county of WORCESTER, 4½ miles (S. E.) from Birmingham. The population is returned with the parish. The living is a donative. The chapel was erected in 1704 by Job Marston, Esq.